Bring out the bear cub in your child! 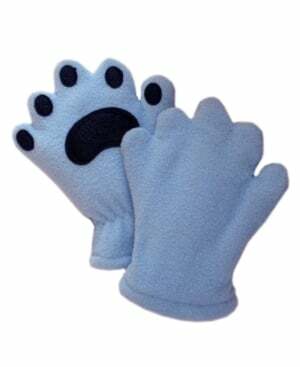 These ThinsulateTM lined fleece mittens are adorable protective clothing used to cover the hands to keep them warm. Mittens are similar to gloves, in the way that they cover and help the hand to keep it warm in cold weather especially this upcoming holiday season. However, while gloves are made for covering the four fingers and a thumb, mittens are specially made for covering all fingers including the thumb. These Toddler Fleece Mittens with a unique bear hand design with black non-slip PVC pads resembles a bear paw. It is made of Polyester Fleece, it is imported and hand washable. Oversized mitten style keeps the oh-so-cozy fingers altogether. Sizes are available from infants to toddlers. There are many colors to choose from: Brown, Camel, Fuchsia, Blue, Light Pink, Powder Blue, and Red. These mittens are not just adorable, they are very functional. The outside is made of wool and it will feel like a ski glove quilted and warm on the inside. This is a great gift for your child. If he is the type of kid who doesn’t like getting dressed, hates putting on his coat and like to run around naked, he will surely fall in love with these mittens. He can run round around the house “growling” like a bear, and show it off to everyone he can.